A fresh resource for people who plan and manage meetings, events, business travel, promotions and incentive programs. Providing you with inspiration, guidance and great ideas. 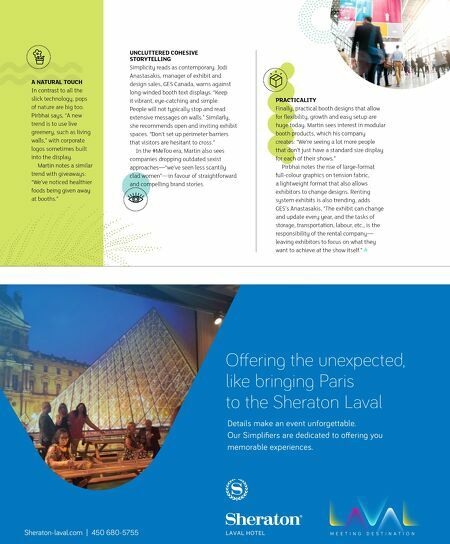 12 | Ignitemag.ca | February | March 2019 LIGHTING "LED lighting is also a new trend that certainly enhances any exhibit," says Nasera Pirbhai, creative manager at GES Canada in Toronto. Beyond wordlessly signalling an organization's environmental commitment, she says energy- efficient LED technology adds wow factor. "From backlighting the large tension fabric graphics and colour-changing lights, to strip lights surrounding corporate logos, these all serve to increase the visibility of any exhibit." Martin also sees LED lighting used to add height: "We're seeing more towers with backlighting." w INTERACTIVITY A crucial strategy when engaging millennials, innovative interactive approaches often involve technology. "Probably 80 per cent of the booths we're designing and building have some sort of AV component," says Geoff Martin, CEO of Best Displays & Graphics in Markham, Ont. "People are putting monitors on to convey their story, or do a presentation, or update people on their products. We're seeing more touch screens on booths where people can actually interact with the monitor." Similarly, Martin sees more booths decked out with selfie stations, high-tech photo booths and LED video panels. 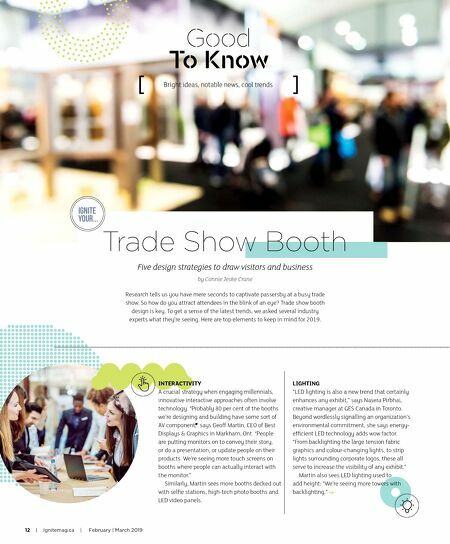 Bright ideas, notable news, cool trends Good To Know Five design strategies to draw visitors and business by Connie Jeske Crane Trade Show Booth Research tells us you have mere seconds to captivate passersby at a busy trade show. So how do you attract attendees in the blink of an eye? Trade show booth design is key. To get a sense of the latest trends, we asked several industry experts what they're seeing. Here are top elements to keep in mind for 2019.